Morgan Freeman is one of the best actors of his generation. He also happens to have one of the best voices. He has lent his voice to dozens of documentaries and cartoon characters. He currently narrates and hosts the science documentary Through The Wormhole on the Science channel. 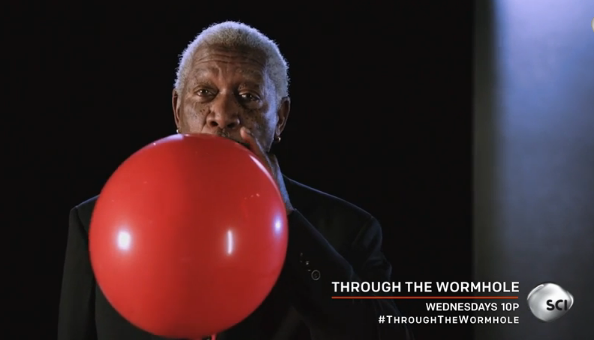 In a promotional video for an upcoming episode of Through The Wormhole, Freeman inhaled helium and then started talking with an altered voice. This of course can be easily explained by science. Craig Montgomery has written a piece for the Scientific American magazine explaining it and you can read it here. Helium is a colorless, odorless, tasteless, and inert gas. It's also non-toxic so don't you worry about Mr. Freeman inhaling a lot of it.